Last year, we told you about an awesome animal jigsaw puzzle with a hefty price tag ($740!!) by Italian designer Enzo Mari. Luckily, the folks at Petit Collage have come up with a version that’s much more affordable and green! The Safari Jumble puzzle is made of FSC-certified natural beech wood and will set your family back a lot fewer greenbacks. 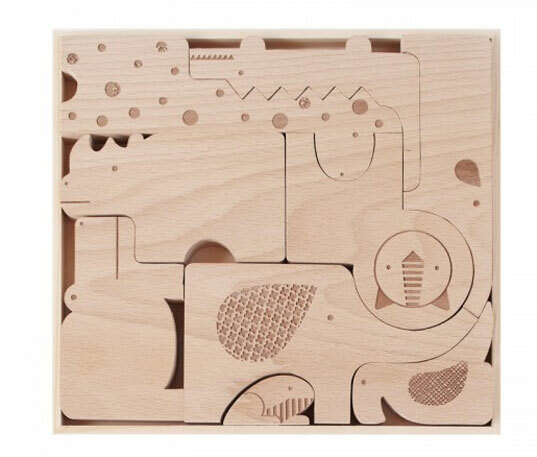 The puzzle contains nine cute, laser-etched creatures big and small, including a frog, a rhino, a giraffe, and an elephant. The animals can be stacked, played with, or fit together snugly in their wooden tray (read: lots of play options plus easy clean up!). Let the wild rumpus begin! Last year, we told you about an awesome animal jigsaw puzzle with a hefty price tag ($740!!) by Italian designer Enzo Mari. Luckily, the folks at Petit Collage have come up with a version that's much more affordable and green! The Safari Jumble puzzle is made of FSC-certified natural beech wood and will set your family back a lot fewer greenbacks. The puzzle contains nine cute, laser-etched creatures big and small, including a frog, a rhino, a giraffe, and an elephant. The animals can be stacked, played with, or fit together snugly in their wooden tray (read: lots of play options plus easy clean up!). Let the wild rumpus begin!